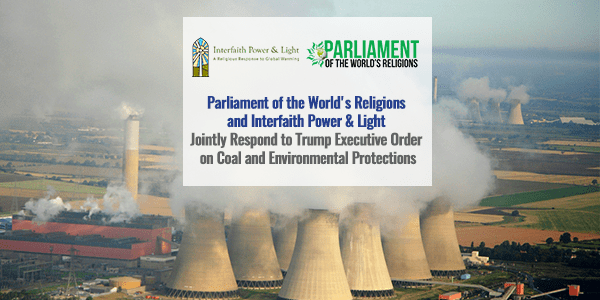 March 30, 2017 — President Donald Trump’s actions this week to reverse the steady progress being made in confronting the challenge of climate change are not only alarming and dangerous; these actions are immoral. Based on a flawed understanding of both economics and science, the President’s action compromises Americans health and safety, damages our economy in both the short and long term, and undermines our children’s future wellbeing and security. Larry Greenfield is the Executive Director of the Parliament of the World’s Religions. He was recently executive minister of the American Baptist Churches of Metro Chicago, a regional judicatory of the American Baptist Churches U.S.A, and the theologian-in-residence for the Community Renewal Society, a progressive, faith-based organization in Chicago that works to eliminate race and class barriers and advocates for social and economic justice. He received his Ph.D. from the University of Chicago Divinity School, where he subsequently taught and served as dean of students. Later he served as president of Colgate Rochester Divinity School in Rochester, New York.